A lot has changed since Big was born. (I know. I keep saying that, right? I feel like such a grandma!) But it has. Its been seven years and I shake my head, every now and then, thinking about the changes. Like food. When Big was a toddler, I drove to Babies R Us (this is before I ordered with Amazon Prime, charging through my phone in seconds and having items arrive, shipped to my doorstep two days later) and purchased about 5 insulated pouches and probably 10 ice packs. I had to keep everything dairy cold cold cold. Especially yogurt. Because bad, warm yogurt? That goes in the trash. Not anymore. Fast forward to a few weeks ago while I was shopping the baby aisle and I see Yogurt Blends. On a shelf. In the middle of the store. NOT in the dairy case. What on Earth? Of course, I bought it. I had to. I couldn’t help but be curious about this stuff. OMG. My life has changed. I know, sounds silly, right? But now when I pack up for meetings or a playdate or a Mommy and Me class I can just toss a Yogurt Blend in my bag and not have to worry about packing cold yogurt into an insulated pouch with an ice pack. Is it that big of a deal? Probably not. But. Really. I’m a mom of 3. And Gerber Yogurt Blends has created one less step for me. And I love that. 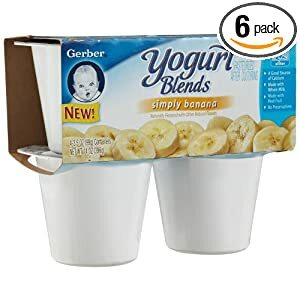 While I’ve been buying Yogurt Blends for a few months now, they recently supplied Mommies with Style with samples of Gerber Yogurt Blends and Gerber Smart Sips for review. My 9 month old loves the yogurt. My question is do I need to refrigerate it if she doesn’t eat it all? I have and its all runny . I did not check expiration on my grandaughters gerber yogurt and found out it expired Nov 17, 2017. Today is January 18, 2018 yikes! Should this be thrown out or can it be used if sealed? Shame on me for nor checking dates! Glad to hear your LO enjoyed it. Please be aware that it contains sugar, thickener and other additives. Personally I wouldnt give it to my LO.